What a beautiful, spacious home in the most stunning of locations! The views are spectacular across the white sands to the ocean complete with jaw-dropping sunsets. The house is beautifully designed with clean lines, large wonderful bathrooms and a fully equipped kitchen. We made a fire in the great fireplace on a chilly night. We loved our stay and didn't want to leave. It's gorgeous! Perfection! Spectacular views at a very special location. 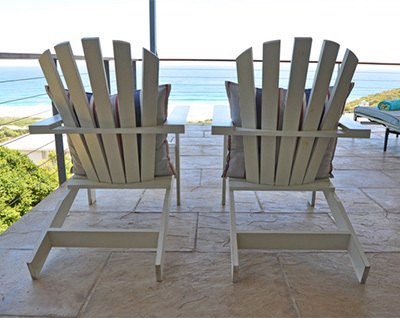 An ideal place to curl up on the couch, sit on the deck with a good book, have a dip in the small pool or go for a stroll on the beautiful beach! A wonderful place to spend time with our family. Fantastic house, located in a lovely area. Rent this home with confidence. The Scarborough area is wonderful and the house is located next to a hiking trail and walking distance to the beach, a gourmet grocery, and restaurant. We could feel very safe because security was in the village and the house was secured with alarm. But even so there was no danger to be feared. Someone who is looking for peace and relaxation, this is the right place. We would return again at any time to this little paradise. A little piece of heaven! 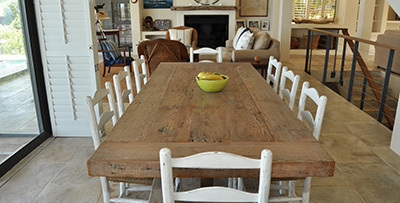 Our family of 5 has fallen in love with this property and it will always occupy a special place in our hearts. The architecture of the property is stunning. The area is safe and great for children. Our children walked to the nearby shop and restaurant most days. 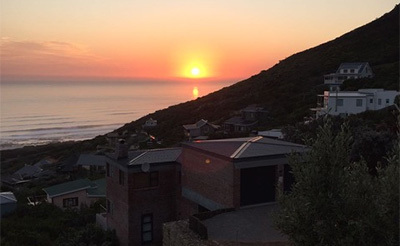 Scarborough is the ideal tranquil setting to use as a base to explore the beaches, towns, mountains, wine farms and city in and around Cape Town. Sue and Alex are great hosts and we feel very happy to give their property the highest possible rating. Ocean’s Horizon is a fantastic house with dramatic views, where nothing is missing. Scarborough a village that still seems unspoiled and untouched where nature and sea in perfect harmony creates the background for a wonderful stay. We enjoyed our eleven days in the house so much that we stayed in the house and the village rather than going for further excursions in the Cape. Many wonderful walks on the beach, afternoon on the terrace, a glass of wine at sunset and dining prepared in the fantastic well-equipped kitchen, that is, a perfect holiday. Our hosts, Susan and Alex were very attentive and helpful. We will be more than happy to return to this paradise! We loved the small town charm of Scarborough but were still close to so many other attractions. Our stay here exceeded our expectations! We would love to come back again!